Scout is a progressive investment company located in an historic office building in downtown Kansas City. The floor plate having only a 10’ nominal clearance required careful and strategic organization of HVAC and electrical systems in order to maximize ceiling height programmed areas. Due to this significant limitation, a fundamental organizing principle adopted early in the project focused on delineating the public spaces surrounding the building core from private offices and meeting rooms located along the building perimeter. This was achieved by dropping a bulkhead to create a spatial compression that would also be used pragmatically to contain mechanical and electrical equipment. Indirect illumination for public circulation and private offices is supported by the bulkhead, effectively eliminating any visual presences of luminaires. Glass walls with frit offer acoustical and visual privacy between public and private zones while maximizing daylight transmittance to more interior spaces. Light coves in the offices are controlled by vacancy sensors which require manual on operation and but turn off automatically when the office is vacated. As well, window shades offer control of daylight which is adequate without cove lighting in most daytime conditions. 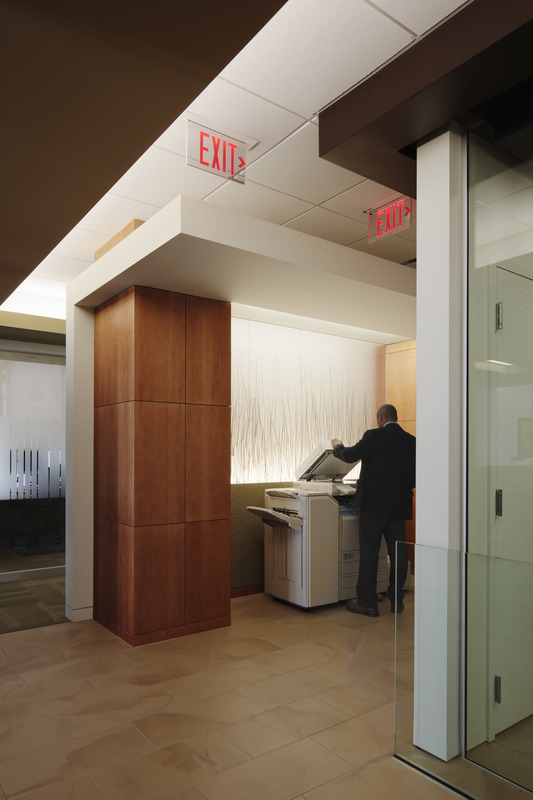 The combination of shade control, ambient and task illumination offers versatility and required quantity and desired quality of light throughout the day. Administrative support niches located around the building core are distributed throughout the floor. 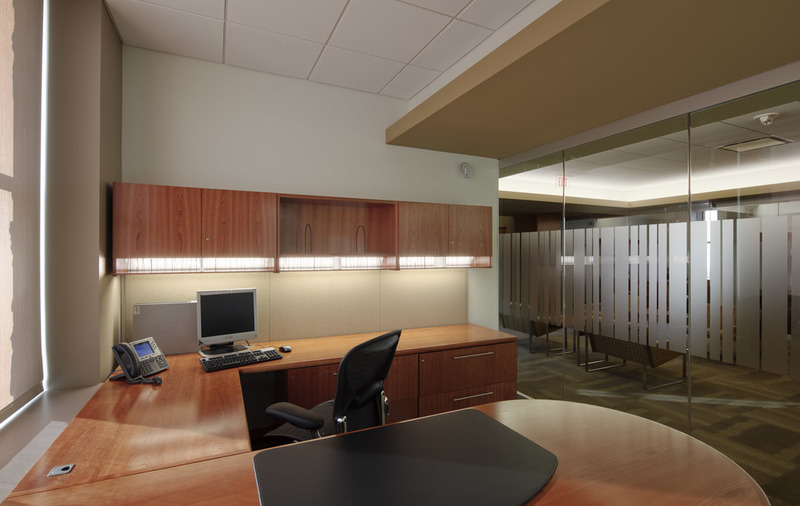 These task niches inset within wood casework contain light coves that provide visual accent and task illumination. Incidental light from these task areas provides required illumination for circulation. The lighting design was developed in an integral manner with the interior design in support of private and public programmatic interests while creating an open, visually clean and inspired work space.